FIU’s Greek organizations last school year contributed more than $100,000 to local and national charities and completed more than 15,000 hours of community service. They also installed one of their own as Student Government Association president at the Modesto A. Maidique Campus—the 13th straight year that a fraternity brother or sorority sister has held the post—and served as organizers for the university-wide annual Dance Marathon and Relay for Life fundraisers. The sisters of Phi Sigma Sigma during their annual kickball tournament to benefit Janelle’s Wishing Well Foundation, which raises awareness of the dangers of carbon monoxide poisoning. In the wake of a negative outlier—a fraternity that last month lost its FIU charter from the national organization for conduct unbecoming and possible illegal activity—the remaining nearly 1,500-strong Greek community can hang its collective hat on a record of giving, leadership and academic achievement. Comprising just 4.5 percent of FIU’s undergraduate population, Greeks have a surprisingly huge impact on campus—or maybe not so surprising once you get to know them. That strength translates into more people working toward tangible goals in a highly coherent fashion. For example, Delta Phi Epsilon Sorority—which currently has 145 active members and expects to add as many as 75 during the current recruitment period—last year raised $8,256 for the Cystic Fibrosis Foundation, $3,661 for the Children’s Miracle Network, $7,156 for the American Cancer Society and $4,000 for the Livestrong Foundation, and its sisters hosted a used-jeans drive for local youngsters in need of clothing for school; as a group wrote letters of thanks to soldiers stationed overseas; made pillowcases by hand for distribution by an organization that works on behalf of children with cancer; and collected new coloring books and crayons for distribution by one of its sisters during a mission trip to the Dominican Republic. 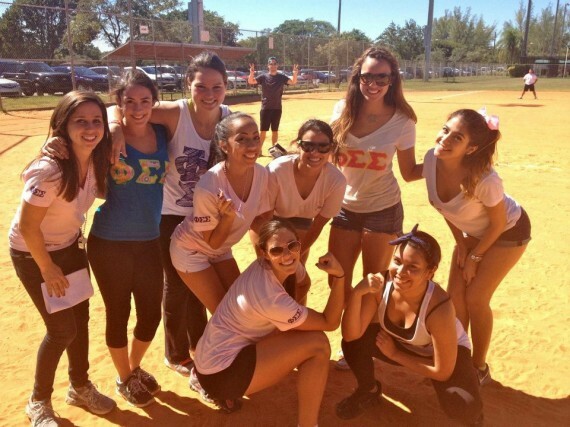 Other Greek organizations hold a sports tournament and ice-cream social in support of Autism Speaks, organize a tea complete with entertainment and a “big hat fashion show” to raise funds for global nonprofit Heifer International, and read books to patients at Miami Children’s Hospital, and the list goes on. Greeks also participate heavily in campus-wide groups and activities. Aside from almost exclusively serving as president and vice president for SGA at MMC—fraternities and sororities are perfectly organized to campaign for their chosen candidates—they also hold the majority of seats in the SGA Senate and they have their own intramural sports league. And they are overrepresented among those serving as student ambassadors, peer advisors and residence hall assistants. 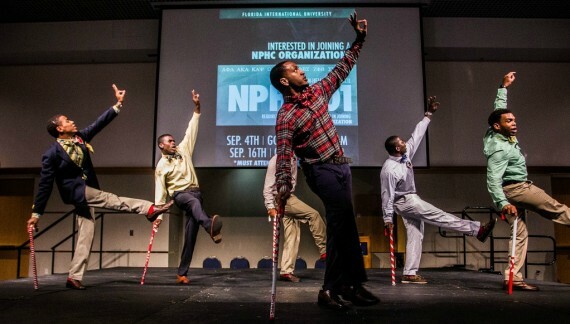 During FIU Welcome Week at MMC, the brothers of Kappa Alpha Psi show off their “stepping,” a dance form that has roots in African-American cultural traditions. When it comes to Homecoming, Greeks put forward most of the candidates for Homecoming court. The commitment to lead and to serve the greater community comes from each fraternity’s and sorority’s individual national organization—a network of campus chapters across the country that together share common goals, often beneath a unifying motto or philosophy. Additionally, each of the 35 sororities and fraternities at FIU must follow the rules and guidelines of one of four governing councils. These collectives of Greek organizations offer leadership and networking conferences to build members’ skills, establish protocols for recruiting members and set minimum grade point averages to which members are bound. That last directive—to achieve academically—has led to impressive results: Nationally, whereas only 50 percent of non-Greeks complete their college educations, more than 70 percent of fraternity and sorority members graduate. The support of peers likely plays a role. Aside from looking forward to social gatherings with other young people—such as Super Bowl watch parties, co-ed mixers and off-campus excursions—the impetus to join a sorority or fraternity, many say, comes down to wanting more from the college experience. Tierney Suggs, a senior human resources management major and a sister of Alpha Kappa Alpha, says the value of joining a Greek organization can go beyond one’s undergraduate years. “A big part of it is networking,” says Suggs, who in her role as vice president of FIU’s National Pan-Hellenic Council has attended several national conferences. “Not only can you do so much for the organization,” she says, “but the organization can do for you.” She cites opportunities to meet people from all over the country during conferences and being able to call upon alumni with help in job searches. FIU Vice President for Student Affairs Larry Lunsford can attest to the latter. Most Greek organizations stress a lifelong commitment and welcome back alumni as mentors and advisors. That connection between generations can play an important role in motivating undergraduates. What about the Pikes though? They committed their transgressions and as such, they’re no longer a part of Greek Life at FIU. In this case, one rotten apple did not spoil the whole bunch; it is as simple as that.